In Hello Wall a man literally talks to a wall. About the years behind him, during which he suffered a burnout, went through a divorce, saw his father and several best friends die, and had to come to grips with an alcohol addiction. In Hello Wall a man literally talks to a wall. About the years behind him, during which he suffered a burnout, went through a divorce, saw his father and several best friends die, and had to come to grips with an alcohol addiction. The wall does not answer, but it does offer the man a new perspective. 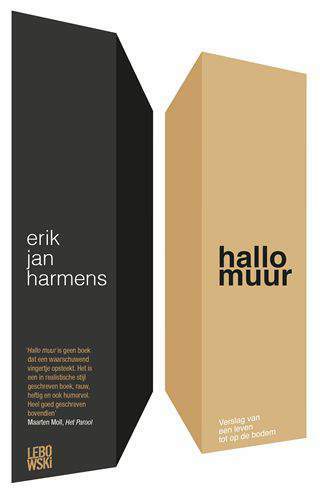 Hello Wall is Erik Jan Harmens’ most autobiographical novel to date. It is an honest, moving and also very funny account of drifting, failing and surviving, and will buoy anyone trying to rebuild a life after hitting rock bottom. Hello wall. You look just the same as yesterday. Not me, I’ve changed. I’m wearing different clothes, I see things differently. I also feel different.